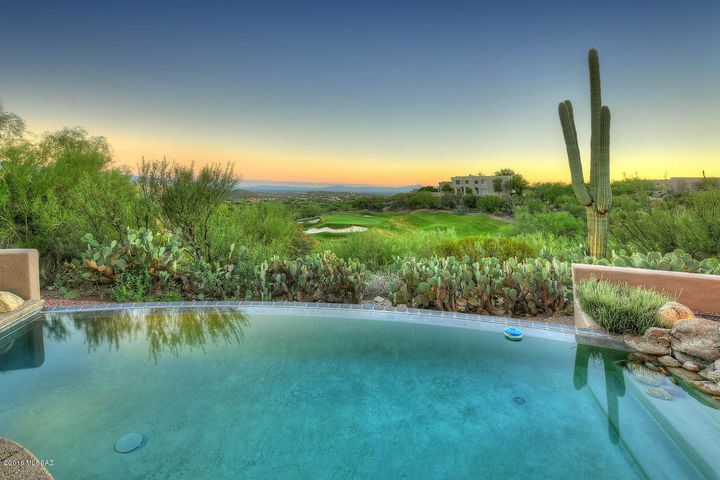 Stellar CITY, GOLF, & MOUNTAIN VIEWS From This 3BR & 3BA w/ Den, Kevin Howard Designed Desert Contemporary Perched High on a Hill in Gated Ventana Canyon. This Very Well Maintained, One Level Home Features an Open Floor Plan, Great Room w/Wood Beamed Ceilings, Floor to Ceiling Windows, Wet Bar, Fireplace, & Flagstone Floors. Island Kitchen w/Granite Counters, Bar, Desk, and Breakfast Nook w/Sweeping Views. Spacious Master Suite Features Sitting Area & Fireplace. Other Features Include: Fountain Entrance, Newer Energy Star HVAC's & Whole Home Water Purifier (2015), 3 Bay Garage, w/Cabinetry + Utility Sink, & Circular Driveway. The Private Outdoor Living Space Includes a Covered Patio, Pool & Spa, Fireplace & Built in Grill all Overlooking The Ventana Canyon Golf Course & City Lights. Directions - North on Kolb from Sunrise Drive, West on Lazulite (Gate at Ventana Entrada) Opposite of the Loews Ventana Canyon Hotel - Gate Code to enter - west to Celsian Place, East to address.